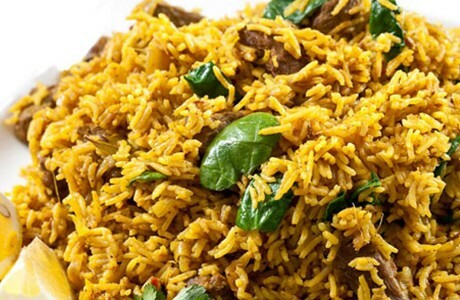 Biryani is traditional Indian, oven-cooked dish blending rice with authentic spices, and meat or vegetables - it is hugely popular in Indian restaurants. This delicious version is layered with tender lamb and fresh spinach. Place all ingredients for marinade in a glass bowl, mix well and chill for at least 2 hours (ideally overnight) and remove from the fridge 1 hour before cooking. Prepare rice by soaking for at least 30 minutes and rinsing well in a sieve until the water runs clear. Add the oil to a large hot pan and fry the cumin seeds; when they start to sizzle add the onion and fry until soft and brown. Pour in the lamb mix, add the tomatoes and continue to cook on a high heat for 5 minutes stirring continuously to ensure the spices are cooked through. Turn the heat to low, cover and simmer for 25 minutes to ensure the lamb becomes tender. Add the bay leaf, rice and vegetable stock, stir and cover again, leave on a low heat for a further 20 minutes. Turn off the heat, remove lid, add spinach and stir once, then replace the lid. Let this stand for 10 minutes to ensure the rice is light and fluffy.